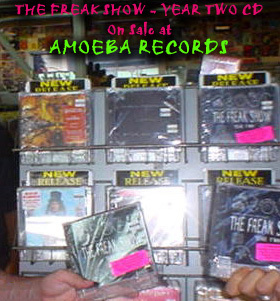 A compilation of all the bands who performed at "The Freak Show" from Aug, 2002 through Aug 2003 is being put together right now! In the past we have produced large runs of the CD so everyone who wanted to buy one could do so. This year we can only do a small run -- so if you want one, don't wait around. E-mail us now and let us know you would like to pre-order a copy. We will arange a payment method and hold a copy for you. The CD will cost as a pre-order and you will get into the final Freak Show party for half price. Some of the bands featured on the CD will be Pansy Division, IAMLOVED, Shugawhipped, Insecto, The Skin Jobs and more. The first two years are still available through Spitshine Records.